Here's a sneak peak of the invite I designed last night, which is pretty astonishing considering we had a double header of soccer and t-ball to go to! But it's for a very beautiful 3 year old who's mommy is planning a special rainbow themed party. This took me back a few years to my rainbow-obsessed youth. Pictures of rainbows, stickers books full of rainbows, heck, I even had rainbow wallpaper in my bedroom! 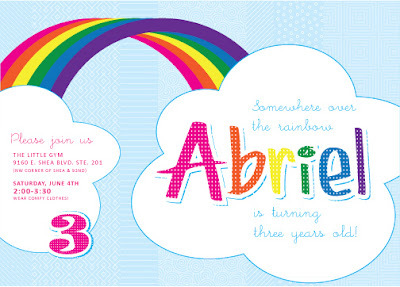 I'm looking forward to designing some fun printables for this party!